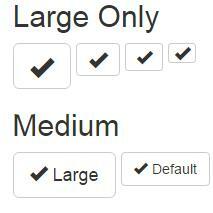 The default Bootstrap buttons is not responsive. When the device is too small, the grid is responsive and change the layout, but the buttons stay the same. This tutorial show how to toggle the text from a button when the device required it. The default buttons Text is not responsive. On smaller device, it will break the layout because of the buttons size. Responsive buttons needs to repond the same way as the grid. On smaller device, text is expected to disappeared on targeted buttons. Button icon must stay the same. The hack is just a little more CSS with a new set of Class named like those of the Grid system : btn-xs-text, btn-lg-text, etc.